Whether or not you celebrate il giorno di San Valentino, or Valentine’s Day, you’re probably seeing a lot of hearts around today. And flowers and chocolates and all kinds of traditional symbols of this day of love. Ancient Egyptians believed the heart (ib), rather than the brain, was the center of wisdom, emotions, memory, soul, and the key to the afterlife–and most of us know that “heartache” really does describe the pain of love lost–but the shape of the human heart really looks nothing like the heart shape that we all know today. Well Tears for Fears came pretty close to the answer in 1989 when they sang about Sowing the Seeds of Love. Who knew? See the coin on the right? It’s from Cyrene, an ancient Greek colony in what is now Libya, and depicts the seed pod of silphium, a member of the fennel family that is now extinct. The crop was extremely important to the Cyrenian economy–so much so that much of Cyrene’s currency featured this plant believed by the Greeks to have been a gift from Apollo following a flood in 7 B.C. Silphium was used in cooking and was also a kind of miracle herbal remedy for cough, sore throat, fever, indigestion, aches, pains, and more. What does this have to do with the heart as a symbol of love? Could silphium have been the world’s first morning-after pill? 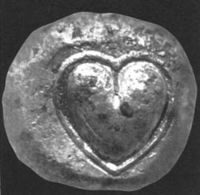 We’ll never know for sure since all subsequent attempts at growing silphium have failed, but it seems that the seed pod’s image lives on, ironically perhaps, in our symbol of love–the heart. Happy Valentine’s Day and Happy Love Thursday! Fascinating post! Happy Valentine’s Day, Sognatrice! Thanks! Hope you had a lovely day as well. Happy Valentine’s Day to you, too! Thanks for the great historical info. Very interesting! THanks for sharing and happy V-day! Thanks Diane; hope you had a great day! Well I never… you learn something new every day!! Glad you enjoyed, and thanks! Interesting facts! Happy Valentine’s Day, Michelle! I love the stuffed animal. Is that a giraffe? So cute! Very interesting– I always find herbology interesting, medicinal and culinary. Happy Valentine’s Day! Happy Valetines Day, Michelle. Interesting about the silphium. On an episode of ROME, I remember one of the slaves gave a pregnant girl some herbal concoction that she got from an herbalist. She got sick, lost the baby and died. Maybe the work of silphium???? My Melange’s last blog post..So, what’s in a name? Interesting. The woman wasn’t supposed to get sick and die though! Hmm…. Wow. How interesting. Those ancient Greeks, Itellyawhut! This is my first participation in ‘love thursday’; I hope you’ll stop by for a visit! okay, now THAT was interesting! First I learn all about nutella, now about heart symbols and Valentine’s Day. I can always depend on you for a fascinating post! Hi Jenn, nice to see you! Thanks for the compliments and for the Valentine’s wishes. Hope you had a lovely day as well! Once again, you’ve enlarged my understanding! Happy Valentine’s Day! Made the mousse, got the prosecco in the fridge, who knows I might even put the heating on! Have a happy day. Interesting. I’ll have to check out the additional history – with a title like that, who could resist?! nyc/caribbean ragazza’s last blog post..This Phyllis Hyman song sums up a typical Valentine’s Day for this Ragazza. I’ve always thought that the ‘heart’ was a slightly icky association. That was a great, post, Michelle! I had no idea from where the “heart” symbol originated. Very cool! 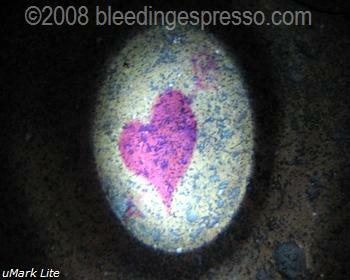 Christina Arbini’s last blog post..Happy Valentine’s Day! This was fascinating! I had no idea about silphium. Thanks! Hope you had a great day too! A Novelist’s last blog post..Happy Valentine’s Day! Thanks! And also to you and John! Sofia (my 10-month-old) and I went around the house this morning taking pictures of the different hearts we had for my post today. I always enjoy learning these things, and I love your photos. Always educational! Happy Valentine’s Day! OH…I just love the history of all the symbols we use so freely…I was a research hound when I got married so that I could really only include the things in my ceremony that meant something to me…. That ancient Egyptian heart would make an amazing salt shaker!!! Janet’s last blog post..T #107: Happy Valentine’s Day*! Buon San Valentino a te, sognatrice ! Great post! Great minds must think alike. I posted about how hearts came to be a symbol for VD today too! I guess hearts are on everyones mind today! Great minds indeed; what a great recipe today! Goats huh? I’ll take the chocolate and flowers. This was SO intriguing! I didn’t know any of that, and it was great to learn, thanks! Happy Valentines to you sweet lady! I hope it’s a very good one! Wanderlust Scarlett’s last blog post..Happy Valentines! Hope that you all had a very Happy & Romantic Valentin’s Day. Thanks for another great history lesson. You are too smart. Bon Saint Valentin pleine d’amour! Happy Valentines Day to you too! Hugs from all of us! Ambra Celeste’s last blog post..Danger! what great research and info! Awesome post — very interesting. Happy Valentine’s Day!